Tucked away in a drawer,a Stanley 78 rebate plane rested, handle worn, blade dull.Its moment now close at hand, the light spilled into the drawer absorbed by the japanned handle, but flashing from the blade. The touch of cloth across the body with life protecting camelia oil and and the coarseness of diamonds across the blade fully prepared it for a return to full duty. 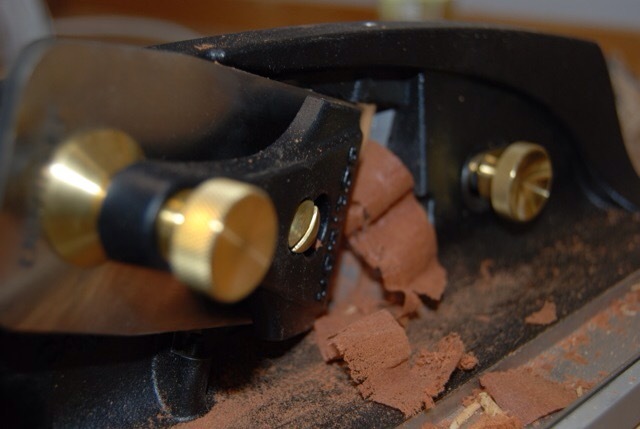 Bringing a tool back to life is one of the joys of woodworking, be it a hand tool or machine. This plane sat for a number of years until there was a need and as I cleaned and learned about it on the web, I gained an appreciation for the subtleties of the tool. It also raised a few questions. 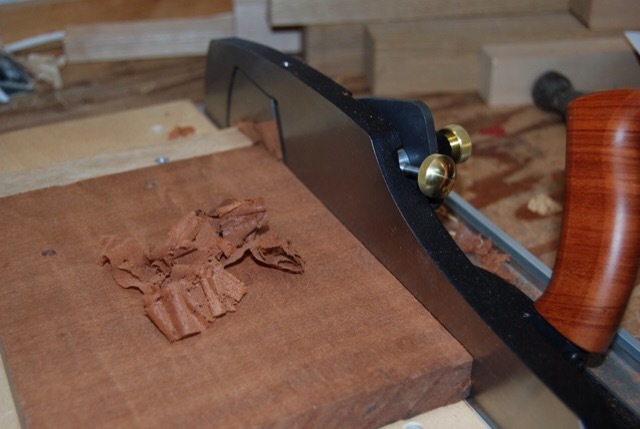 Recently a couple of articles have appeared about the use of Rebate (rabbit) planes, Shannon at the Renaissance Woodworker put together a great video discussing correctly setting the cutter and blade to prevent stair stepping the rebate. Chris Schwarz had an article along similar lines. The question that remains is the design of the edge guide. At first glance the single arm of the Stanley 78 seems flimsy and I question its ability to maintain a consistent rebate, certainly when compared to the Veritas Plane’s double arms which are stiff. Perhaps the position of the single arm at the front of the guide allows the plane to maintain a critical distance at the point of the blade such that the rear of the plane can be ignored. Maybe Veritas is too precise and holding the guide rigid exacerbates any misalignment in parallelism between the blade, cutter and guide making it a more difficult tool to use? Conversely has Veritas improved on a 78 flaw? Or maybe I need to put the tool to work, clear my head and make shavings…..
A favorite plane in the tool chest is the Veritas Plow Plane. Reading this blog you may notice that many comments exist on the joy of curly shavings. Several people have commented on the inability of the depth stop to hold. I’ve not had this problem, possibly because I am super aware and monitor it constantly. A month ago Veritas – Lee Valley came out with a modification to the stop to correct this problem. It is nice to know that Veritas monitors its tool’s performance and not only improves new tools, but is willing to modify existing tools. On top of the changes to the depth stop a change to the plane body would allow the use of beading blades. With a few clicks of the mouse a box was on its way to my address and with some clear instructions I disassembled the plane and sent the parts for modification back to Veritas. Approximately two weeks later my plane returned. From the consumers perspective the system for disassembly packaging and shipping worked great. Over the next few months we’ll see how the depth stop works. Below is a picture along with pictures of the new beading blades, they come in 3 sizes and work quickly and simply. A nice add on to an already great plane. I’m looking forward to trying it out over time. With the shooting board complete it’s time to give the shooting plane a whirl. Over the last couple of years I have been watching eBay, antique stores, and shows for the Stanley 51 shooting plane. Last fall I finally saw one in person while at the Midwest Tool Collectors meet. It, along with a fine looking #52 shooting board sat quietly in a display with a monstrous price tag; after a few moments I hesitantly asked if I could take a look and with a nod permission was granted. In my hands its weight was evident, and it looked well maintained and ready to work. However unable to overcome the price I moved on. This may not be the last time I see a #51, but It will be the last time I’m specifically looking to purchase one. Seeking other avenues I turned to Lie Nielsen and Veritas. I like both companies and have tools from each. This past year at the hand tool show in Iowa I had looked at the Lie Nielsen #51 and the Veritas Shooting Plane. They functioned well, felt good in my hand and appeared to be what I was looking for at a more reasonable price than the hard to find original version. Coming towards the end of the year I had to make a choice and feeling confident with the quality of each, reading every review I could find, I put in my request for the Veritas version. Am I happy with the decision absolutely! Would I have been as happy with the Lie Nieslen…most likely. So instead of a review, here’s my introduction to the Veritas Shooting plane. The first observation of this plane is its weight, too lazy to grab a scale, I’ll just say it is surprisingly heavy. It has a very sleek modern look like many of the Veritas tools it have similarities to the original tool but many improvements. When purchasing the plane there is a choice of o-1 or PMV-11 steel. There have been several positive reports on the PMV-11 steel so I sprung for the extra $12. Without another blade It’s impossible to make a direct comparison, but at this point I am very pleased, it holds an edge and sharpens easily. It took a few minutes to get the plane adjusted to plane an exact 90 degree face. but once done with the allen bolts tightened I don’t expect to do it again apart from minor adjustments. There are many new experiences with this plane, bevel up, blade steel etc. I’ll take some time to fully understand it, but so far I like what I have. Many of you know that my tools are stored in the garage. They live in my small tool chest or in the larger anarchist tool chest.This subjects them to all the temperature changes the midwest can offer and I have at times struggled with surface rust. With more experience (better maintenance) this has become less and less of a problem. I do keep each of my planes in a plane sock. Some of you will yawn and chuckle, but I have found them very effective and have not had to clean rust from a plane in a few years. I’d strongly recommend trying them if you are struggling with rust. 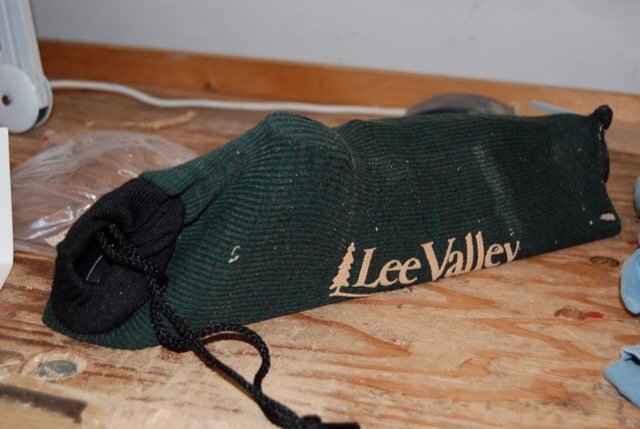 There are many places to purchase them, mine happen to come from Lee Valley tools. There are a couple of safety items that I am adamant about, hearing and eye protection. Damaging either could be devastating to quality of life not only affecting yourself, but those around you. When using power tools these items are no brainers but over the last couple of years I’ve also noticed that while chopping with chisels, by the end of the day I can have some ringing in my ears. Admittedly I have sensitive hearing and wear ear plugs in movie theaters because I find them uncomfortably loud. Putting ear plugs in is a simple solution, however I also enjoy listening to podcasts while in the garage. Turning up the volume slightly I can listen with the plugs in my ears, but it is not ideal. Listening to WoodTalk several months ago I remember a discussion about hearing protection and bluetooth speakers, I’ve also seen modifications made to ear muffs. Digging back through the Wood Whisperer’s site I was able to find the discussion and links to the earmuffs and accessories. After a little more research which resulted in stunned disbelief at the cost of alternatives, I used the Wood Whisperer link to Amazon and purchased the components. If I have heard about a product on WoodTalk and decide to purchase I tend to link through the sites of the hosts, after all if they are going through the trouble of reviewing and assembling the componets they might as well get credit. After the Christmas crunch the package arrived. There are three components to make this work. Earmuffs, a bluetooth link, and a dooley whopper. With everything ready to go I linked the components to my Ipad using bluetooth and amazingly it all worked. A couple of hours later I took them off very happy with their functionality. I get my podcasts, keep my hearing and no more fumbling with earplugs. Sharpening – There is a myriad of techniques and to each technique every woodworker adds their own idiosyncracies. I’ve tried several and I believe they all work. After talking with someone the other day I realized that it’s something I’ve never really discussed on the blog. Here’s mine… hand sharpening, three diamond plates , one strop; occasional use of jig when my hand sharpening gets a little out of hand. Simple right! Didn’t satisfy you did it? EZ Lap diamond plates in 250, 600, 1200 grit. Why these plates? Found them on Amazon had a good price. I’ve been using them for a few years now. Jig for holding plates – Found this simple jig for holding the plates on Paul Sellers’ blog. It was quick to build and works great. Hard to tell in the picture, but I used a table saw to cut all the edges of the cut outs for the plates. Then a hand router to cut to depth. Although not the most lovely appearance after a few years, it continues to serve me well. I use auto glass cleaner on the plates. It contains very little water, therefore eliminating the rust component. Strop – Piece of wood, leather from local craft store, green stuff from harbor freight tools glued to an 8″x 4″ board. I keep it in a vice on the side of my bench and use it constantly. I have no idea what grit the green sharpening compound is, but it works. 25 strokes on 250, check burr, two strokes on back to remove burr. 25 strokes on 600, check burr, two strokes on back to remove burr. 25 strokes on 1200, check burr, two strokes on back to remove burr. 30 hard strokes on strop, two strokes on back to remove burr. I do have a flaw in my technique. I tend to push a little harder on the right side when sharpening thus over time my chisel and irons are not square. When I reach the point of no return I grab a jig and straighten out the iron. I purchased this jig for about $14.00 for Lie Nieslen, I see they now sell their own version for $125. I’m sure they have made modifications and improvements, but I’m perfectly happy with this jig. It is similar to the earlier eclipse models and handles all of the chisels and irons I have. Look around, I’m sure someone is selling them. Last but not least, I use camelia oil on the exposed metal. The final picture are the water stones that sit idle. Maybe I’ll need 8000 + grit one day…..